Robinson Ranch estate overlooking golf course. This Mediterranean style luxury estate home at 14902 Live Oak Springs Canyon Road, Canyon Country, CA, 91387 is located in the Sand Canyon CA area of Canyon Country CA. Located in the lovely Robinson Ranch golf course community, this property overlooks a golf course itself. Surrounded by a valley filled with oak trees and hills that lead up to the San Gabriel Mtns this stunning estate home has a pool, beautiful patio area and outdoor cook area. Built in 2001 this is a California entertainers dream home. 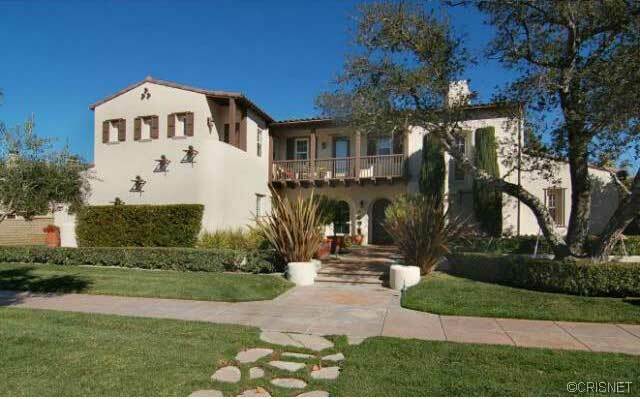 A lovely Sand Canyon estate, in one of Santa Clarita’s loveliest areas. This Sand Canyon home, like many of the homes for sale in Canyon Country CA, offers the privacy and solitude that so many celebrities and those who enjoy the natural environment desire, while still being close to freeways and excellent shopping and restaurants. To view this fabulous home for sale at 14902 Live Oak Springs Canyon Road, Canyon Country, CA, 91387. Please contact Pia Soper either via text or mobile at 661 645 5556. Spectacular Mediterranean Original Model Home located on the golf course in the prestigious Robinson Ranch Estates with miles of unobstructed views! This highly upgraded Magnificently appointed 5 en suite bedrooms, 5 1/2 baths spans on appx 5,500 Sqft. situated on a 19,000 Sqft Lot and offers the ultimate in sophisticated comfort. The Interior highlights includes a gourmet kitchen with granite counters, Viking stove, butler pantry, large island, breakfast bar and an eat in area. Formal living room and a large family room both with fireplace, formal dining room. Downstairs office equipped with desk and built-in’s & a downstairs bedroom suite both with a private entry. A romantic master suite with fireplace, a bonus room / gym and a balcony to enjoy the views and the beautiful sunsets. An upstairs family room and a secondary bedroom with a private exterior staircase. Two interior staircases, plantation shutters, custom window treatments, crown moldings and more… The exterior offers the ultimate in resort style living with a pool spa and views for miles & 4 car Garage with direct access. View more homes for sale in Sand Canyon CA near 14902 Live Oak Springs Canyon Rd.